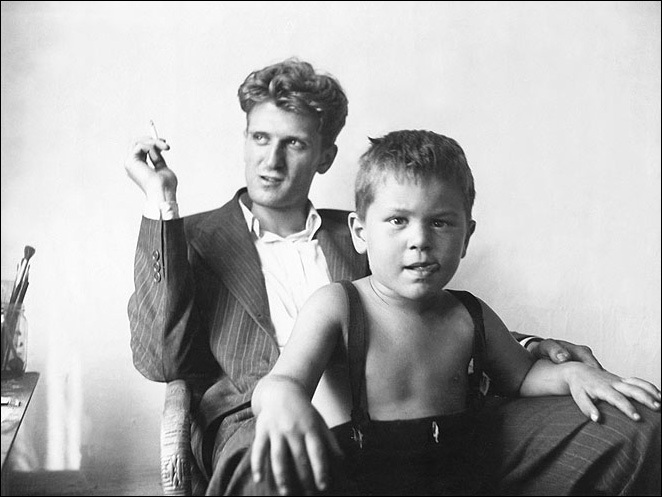 "The police report noted: 'Jackson Pollock... driving a 1941 Cadillac Conv... went off North side of road, hitting three mailboxes (in triangle of intersection) of Louse Pont Road... hitting telephone pole #30 with right front wheel, continuing for 55 feet in a SW direction, hitting a tree head on.'" 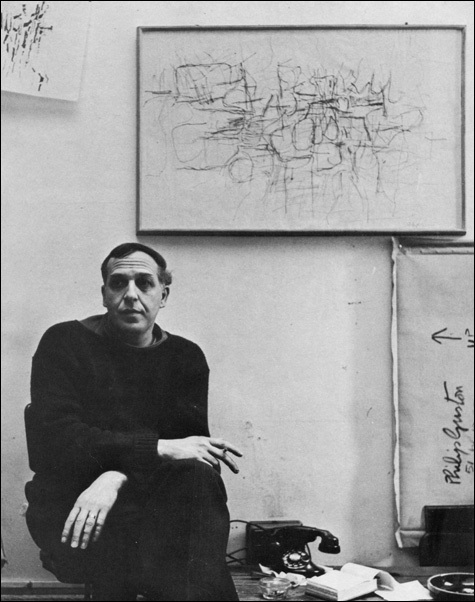 1951: Philip Guston paints White Painting. Musa Mayer, his daughter, later recalled that after Guston took a studio in Manhattan in 1949, "his depression had lifted, and the notion of painting as process began to obsess him." 1951: "Contemporary Paintings in the United States" at the County Museum in Los Angeles. January 1951: Jackson Pollock spends a drunken winter in New York. While in New York, Pollock also wrote and recorded a short narration for Hans Namuth's color film of him painting. Together he and the producer of the film wrote a six minute statement based mostly on earlier statements, beginning with "My home is in Springs, East Hampton, Long Island. I was born in Cody, Wyoming thirty-nine years ago." He objected, however, when co-producer Paul Falkenberg added Balinese gamelan music to the film's soundtrack, reminding Paul that he was an "American painter." When the eleven minute documentary was shown at The Museum of Modern Art in the summer it was accompanied by music by Morton Feldman, an American composer from Brooklyn. January 5, 1951: Arshile Gorky memorial exhibition opens at the Whitney Museum. According to Philip Pavia it was a party for Marca-Relli "after his opening at Kootz," yet according to Adolph Gottlieb: A Retrospective (NY: The Arts Publisher, Inc., 1981), Kootz was showing "Gottlieb: New Paintings" from January 2 - 22. January 11 - February 7, 1951: "Seventeen Modern American Painters: The School of New York" exhibition at the Frank Perls Gallery in Beverly Hills, California. January 12, 1951: "Art in Anti-artistic Times" at the Club, with speaker Heinrich Blücher. January 15, 1951: The Irascibles appear in Life Magazine. The headline for the article was "IRASCIBLE GROUP OF ADVANCED ARTISTS LED FIGHT AGAINST SHOW." See November 26, 1950: The Irascibles sit for their Life magazine photo session. 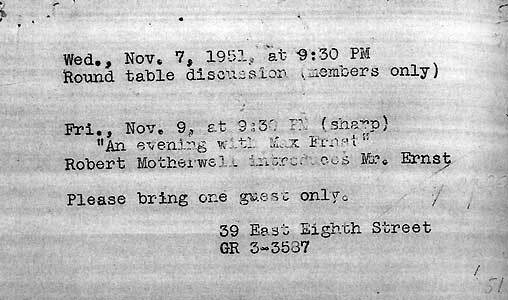 February 2, 1951: "The Unframed Frame: Modern Music" at the Club with speaker Morton Feldman. First week of February 1951: Mark Rothko begins teaching at Brooklyn College. February 1951: Willem de Kooning explains "What Abstract Art Means to Me." February 7, 1951: Jackson Pollock visits Chicago. February 9, 1951: "Something and Nothing" at the Club, with speaker John Cage. March 1951: Cecil Beaton uses Jackson Pollock's paintings for a fashion spread in American Vogue magazine. Beaton used Pollock's 1951 one man show at the Betty Parsons gallery as a location for a fashion shoot that appeared in the March 1, 1951 issue of Vogue. March 1, 1951: "Art and Architecture, Setting" at the Club. March 9, 1951: "Artists should be Homosexual" at the Club. The talk was presumably tongue-in-cheek. Philip Pavia recalled that Harold Rosenberg "didn't think this was funny." (NE161) The speaker was a friend of Rosenberg, the architect Percival Goodman, who, by the time of his death, had a wife, two sons and a daughter. On Broadway, it would be difficult to find a production without homosexuals playing important parts, either onstage or off. And in Hollywood, says Broadway Producer David Merrick, "you have to scrape them off the ceiling." The notion that the arts are dominated by a kind of homosexual mafia—or "Homintern," as it has been called—is sometimes exaggerated, particularly by spiteful failures looking for scapegoats. But in the theater, dance and music world, deviates are so widespread that they sometimes seem to be running a kind of closed shop. Art Critic Harold Rosenberg reports a "banding together of homosexual painters and their nonpainting auxiliaries..."
Homosexual ethics and esthetics are staging a vengeful, derisive counterattack on what deviates call the "straight" world. This is evident in "pop," which insists on reducing art to the trivial, and in the 'camp' movement, which pretends that the ugly and banal are fun. c. March/April 1951: Mark Rothko's final exhibition at the Betty Parsons Gallery - MoMA acquires Number 10, 1950, painted in 'classic' Rothko style. April 13, 1951: Talk on "Magic" at the Club with speaker Kurt Seligman. April 23, 1951: Barnett Newman's second solo exhibition opens. Jackson Pollock, Lee Krasner and Tony Smith installed the show. Works included Newman's first 18 foot long painting, Vir Heroicus Sublimis. April 27, 1951: "Myth and Creative Art" at the Club, with speaker Joseph Campbell, introduced by Leo Castelli. The date of the meeting is also confused. Rothko biographer, James E.B. Breslin, says that it took place during the 1951/52 art season, yet Barnett Newman left Parsons' gallery (on friendly terms) after his April 1951 show. As Newman was presumably still signed to the gallery at the time of the meeting, the meeting would have had to have taken place earlier than the 1951/52 art season which began in the autumn of 1951. Although some accounts of the Parsons' meeting with the artists tend to give the impression that the artists left Parsons' gallery when she would not acquiesce to their demand, their departures actually occurred over the next few years and when they left, they left as individual artists rather than as a group. Rothko didn't leave the gallery until the spring of 1954. On September 27, 1954 he wrote to Katherine Kuh that "As I had informed you at our last meeting in New York, my relationship with the Betty Parsons Gallery was terminated last spring." (RO616n6) Newman left the gallery (on friendly terms) after his April 1951 show. By May 1952 Jackson Pollock had moved to the Sidney Janis Gallery across the hall from Parsons. (Worried that other artists might join him, she bought three works by Still and three by Rothko herself with a gift of $5,000 from a friend. (RO297)) By December 1953, Still signed with Janis without telling Parsons. A selection of Hans Namuth's photographs of Jackson were also published in Portfolio: The Annual of the Graphic Arts (George S. Rosenthal and Frank Zachary (eds), 1951). Spring 1951: Sidney Janis supports Willem de Kooning. May 4, 1951: Concert, music of Pierre Boulez, performed by David Tudor (pianist) with the Juilliard String Quartet at the Club. May 9, 1951: Roundtable/informal session for members at the Club. c. May 1951: Jackson Pollock and Lee Krasner return to the the Springs, East Hampton. Pollock was busy preparing for his next show at Betty Parsons Gallery, painting twenty-eight paintings for the show from May to September. The works were titled Number 1 through Number 28. (JP223) At at time when Pollock was being lauded for his allover abstractions he introduced figuration back into his art. May 11, 1951: Informal talk by Clement Greenberg at the Club. May 18, 1951: "Art and James Joyce" at the Club with speaker Nat Halper. 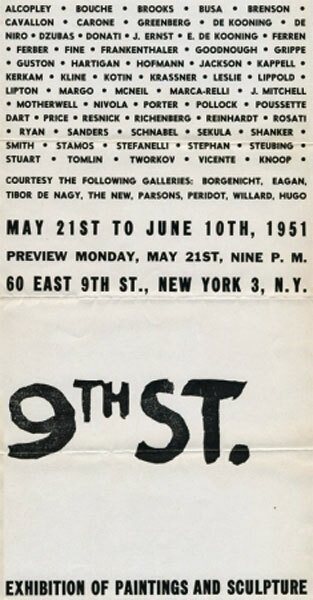 Sixty-one artists were listed on the exhibition announcement/poster which was designed by Franz Kline. (FK178) According to Kline biographer Harry F. Gaugh, Kline's black and white abstraction, Ninth Street, took its name from the show. (FK178). Although Leo Castelli would later refer to the exhibition as "a celebration of Abstract Expressionism" (AD86), it did not include any work by Adolph Gottlieb, Barnett Newman, Mark Rothko, Clyfford Still or William Baziotes. (IS38/9) Jackson Pollock was represented by Number 1, 1949 (PP326) and de Kooning by Woman (1949-50). The opening of the show seemed like a Hollywood premiere, despite the lack of coverage in the general press. Thomas Hess reviewed the opening for Art News. New York’s avant-garde [Ninth Street; to June 10] gathers spectacularly in a 90-foot former antique shop, newly whitewashed (by the exhibitors) for the occasion. An air of haphazard gaiety, confusion, punctuated by moments of achievement, reflects the organization of this mammoth show which, according to one of the organizers, 'just grew.' Some pictures were chosen by the artist himself; others picked by small delegations of colleagues. A few entries were accepted because 'so-and-so' is 'such a nice fellow'; a few because 'such-and-such' was a 'great help'; several for no conceivable reason whatsoever. Some out-of-town guests were invited; some in-town ones were simply forgotten; a number decided to make their absences conspicuously felt. But such hi-or-miss informality and enthusiasm has resulted in a fine and lively demonstration of modern abstract painting in and around New York - or, more properly, Greenwich Village. Authoritative statements come from De Kooning, Pollock, Franz Kline, Tworkov, Hofmann, Kerkam, Vicente, Brooks, Motherwell, McNeil, Cavalon, Reinhardt, and sculptors David Smith and Peter Grippe. Among the lesser-known painters - whose extensive representation will make this exhibition doubly interesting to specialists - we especially noted Resnick, E. de Kooning, De Niro, Farber and Sanders. A number of the others seemed amateurishly avant-garde, attempting to pick up technique which had been created to express complicated ideas, and simply elaborate cleverly upon it. Their results are pretentious, huge, but nevertheless dainty and feminine, despite all the slappings and dashings. Still other canvases make pleasant wallpaper for the many powerful works presented in this lively manifestation of energy and accomplishment. May 25, 1951: "Music of Pierre Boulez" at the Club with speakers John Cage and Morton Feldman. Summer 1951: Robert Motherwell teaches at the summer session of Black Mountain College. It was his second summer session teaching at the college. He had previously taught there during the summer of 1945. June 4, 1951: "Forty American Painters, 1940-1950" at the University of Minnesota, Minneapolis. June 7, 1951: Jackson Pollock paints it black. The Ninth Street Show revealed the strength of abstraction and expressionism. Afterwards, the younger artists stormed the Club and the membership jumped from sixty to one hundred twenty. The Club became known for being avant-garde, and its name spread throughout the general culture. June 15, 1951: "Heidegger and Need of the Time" at the Club with speaker William Barrett from Commentary magazine and New York University. June 26 - September 9, 1951: "Selections from 5 New York Private Collections" at The Museum of Modern Art. Autumn 1951: "60th Annual American Exhibition: Paint and Sculpture" at the Art Institute of Chicago. October 12, 1951: "Collaboration of Art and Architecture" at the Club, with speaker Peter Blake, friend of Mercedes Matter. None of the fourteen paintings sold. October 19, 1951: "Artists Answer to Collaboration of Art and Architecture" at the Club with speakers Willem de Kooning, Nicolas Calas and Ad Reinhardt. November 2, 1951: "Ideas and Form" at the Club with slide show and speaker Sybil Maholy-Nagy. November 23, 1951: "Modernity and the Modern World" with speaker Lionel Abel at the Club. November - December 1951: Franz Kline's second solo exhibition at the Charles Egan Gallery. December 7, 1951: Lionel Abel at the Club. December 26, 1951 - January 5, 1952: "American Vanguard Art for Paris Exhibition," at the Sidney Janis Gallery. The show traveled to the Galerie de France in Paris from February 26 - March 15, 1952. The twenty artists included in the show were: Philip Guston; Matta; Loren MacIver; Josef Albers; William Baziotes; James Brooks; Willem de Kooning; Robert Goodnough; Arshile Gorky; Adolph Gottlieb; Hans Hofmann; Franz Kline; Robert Motherwell; Jackson Pollock; Morgan Russell; Ad Reinhardt; Mark Tobey; Bradley Walker Tomlin; Jack Tworkov; and Esteban Vicente. December 28, 1951: Jackson Pollock wrecks his car.